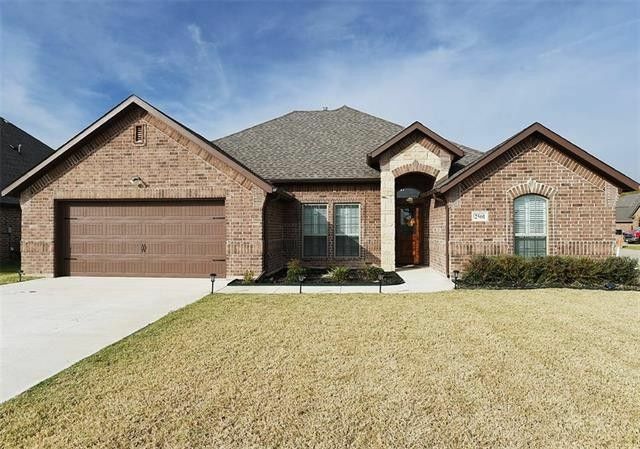 This luxurious custom one-story brick home in Heritage West offers the finest of details & an ideal floorplan! Stunning HARD WOOD FLOORS throughout the family room, breakfast area, study-formal dining room & entryway. The heart of the home, the elegant kitchen, has 42 inch white cabinets, granite countertops, stainless steel appliances, premium gas range & breakfast bar overlooking the family room-breakfast areas! The secluded master suite offers granite countertops, dual sinks, garden tub, big separate shower, huge walkin closet & 17X13 bedroom. Two private guest rooms with walkins share a full bath! Perfect study-formal dining room off the entry way! PLANTATION SHUTTERS ON MOST WINDOWS! 15X9 COVERED PATIO! Directions: Off Interstate 35, take 455 West. Turn left onto N. Tejas Dr. into Heritage west Subdivision. The home is at the back of the neighborhood on the interior corner of Wichita Trail and N. Tejas Dr.